PIZZA!!!! We are excited to be posting this recipe! 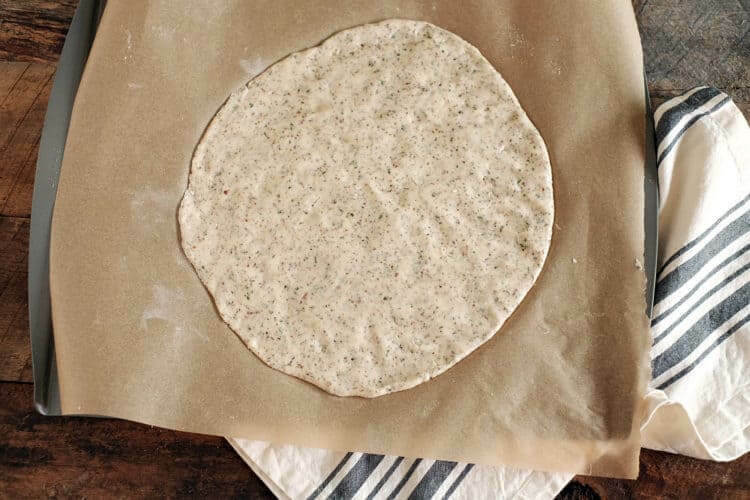 We played around with it for a while and are so very happy to have a paleo pizza crust recipe on our site – one that does not contain cauliflower. Before going paleo I enjoyed a good cauliflower crust pizza, however, it contained cheese as a binder in the dough. I was hopeful I could re-create without the cheese. I quickly learned cauliflower pizza without the cheese is not for me! So we set out on a quest and started trying various pizza recipes we found online. We finally found a REALLY good one from Bill and Hayley at Primal Palate. 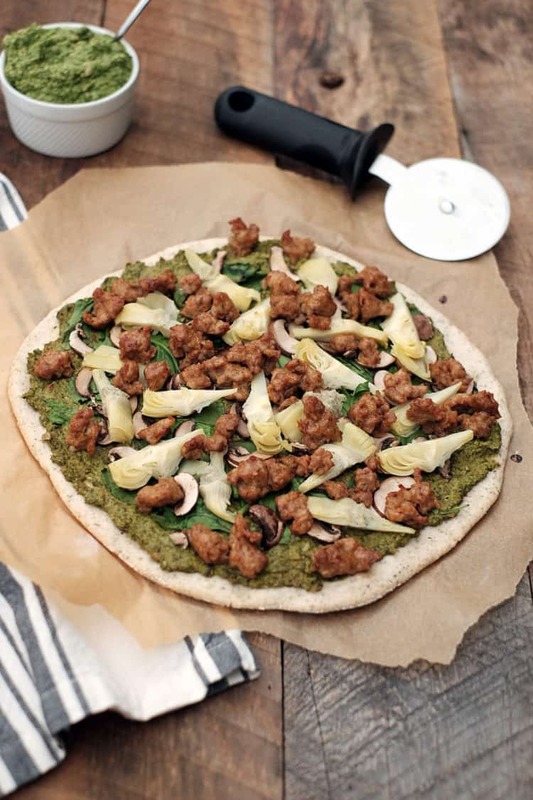 In their cookbook, Make it Paleo II, they have a recipe called Nightshade-Free Pizza and it’s really good! We’ve made it so many times, and enjoyed it with various toppings. 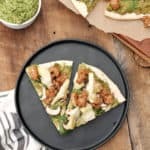 After doing a food sensitivity test, and cutting out coconut (for a while), we decided to try to remake the Primal Palate crust sans coconut…and here’s our result! It’s really great. 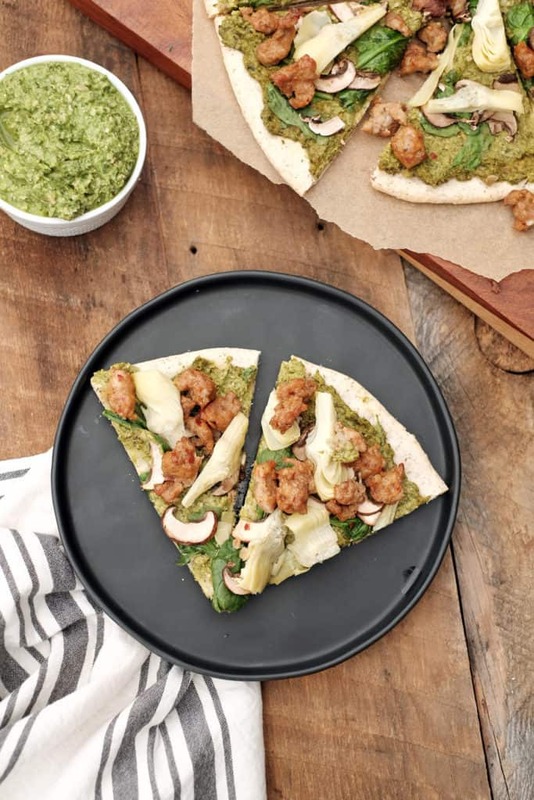 You can pick up the pizza and eat it with your hands, and while we love our pesto as the sauce, you could use a tomato based sauce and choose your favorite toppings. We love sausage, artichokes, mushrooms and greens most of the time, but occasionally some tomatoes and onions make their way onto our pies too! The consistency of the dough itself is almost like a thick glue. If you use a little extra tapioca starch on the ball of dough it spreads out with just a little effort. You can see the crust is about 3/8 inch thick. And the end result for this paleo pizza crust is dang near close to a regular thin crust pizza! Holy moly, paleo never tasted so good! We hope you enjoy this paleo indulgence just as much as we do! It’s a great treat! Make a little hole in the flour mixture. It's like a little mote for your wet ingredients. Pour your whisked eggs, water and melted (and cooled) butter into the mote. Mix everything together, starting with a spoon. You may want to just get in there with your hands to get the job done. Form the dough into a ball. Use a little extra tapioca flour to coat the dough ball. 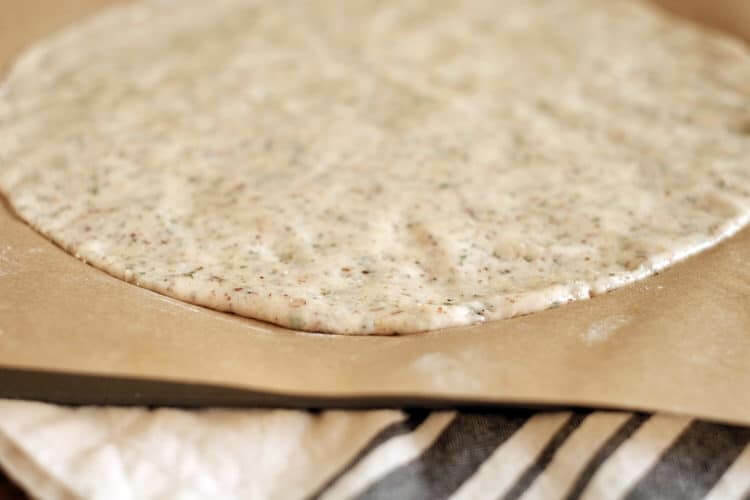 Place the ball of dough on your parchment lined baking sheet and spread it out into a circular shape. You want to get it to about 3/8 inch thick. I use my hands and press it out. I've found the dough just ends up sticking to a rolling pin, so learn from my mistakes and use your hands. Once you've gotten your dough pressed out, place it in the oven and bake at 350 degrees for 20 minutes. Remove your crust from the oven and top with your favorite toppings. We love using our pesto sauce, sausage, mushrooms, and greens. Once you've topped your crust, place it back in the oven. This time heat it up to 400 degrees, and bake for another 10-15 minutes until the toppings heat and crisp just a little. Remove from the oven and let cool for a few before you slice and eat up! Thanks for leaving your comment and trying our recipe! We hope you try some others, too!